Americans place high value on butterfly royalty. A recent study suggests they are willing to support monarch butterfly conservation at high levels, up to about 6 ½ billion dollars if extrapolated to all U.S. households. 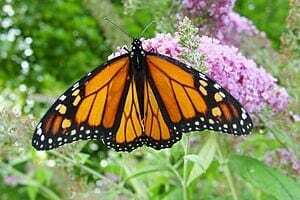 The authors suggest that the universal popularity of monarchs could encourage a market for monarch-friendly plants. “This is the first nation-wide, published, economic valuation survey of the general public for an insect. The study indicates that economic values of monarch butterflies are potentially large enough to mobilize people for conservation planting and funding habitat conservation,” said John Loomis, the lead economist on the study from Colorado State University. According to the annual survey of the National Gardening Association, households that identify as “do-it-yourself lawn and gardeners” spent $29.1 billion in related retail sales in 2012. Unfortunately, many plants purchased by gardeners have been treated with systemic insecticides that can kill both pollinators that consume the nectar, and caterpillars, like monarchs, that eat the leaves. “This study shows that not only might consumers pay more for monarch-friendly milkweeds grown without systemic insecticides in the potting soil, but also that consumers might be more interested overall in buying nectar-producing plants or milkweeds if they knew a small percentage of sales will be donated to habitat conservation,” said Diffendorfer. April 4, 2019 - Monarch butterflies make a dramatic comeback in 2019 KBTXA Texas A&M researcher says Texas will see a dramatic increase in the number of monarch butterflies this spring. April 16, 2019 - More monarch butterflies may return to Midwest with warmer weather WDAF FOX4 Kansas CityNear KINGSVILLE, Mo. -- Warmer weather brings a return of Monarch butterflies as the colorful creatures migrate north from Mexico during the next few weeks.